I had the opportunity to use the FuelBelt Tech Fuel Hand-Held Running Water Bottle for several medium-length runs. All of the runs were completed under hot, humid conditions, and they were all in the 6 – 10-mile range. The FuelBelt Tech Fuel Hand-Held Running Water Bottle was extremely comfortable to use. The strap did not make my hand feel hot. The bottle was securely fastened to the strap. It was easy to adjust the strap to fit my hand perfectly. The nozzle of the water bottle was easy to drink from. This type of nozzle was used in other hydration systems I have owned. I did not have to slow down to a walk to drink from the nozzle, (unless I wanted to!) 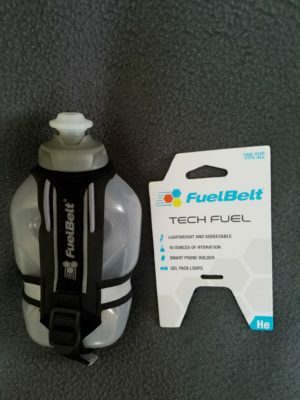 I have had problems in the past with leaking water bottles that leave my hand wet, but there were no leaks from the FuelBelt Tech Fuel Hand-Held Running Water Bottle. The one feature that I could not use comfortably in the FuelBelt Tech Fuel Hand-Held Running Water Bottle system was the phone holder. My Samsung Galaxy S7 phone was securely held in the phone-holding straps of the system, but adding the phone caused the entire system to bounce as I ran. This was not comfortable, and I felt it was distracting. I suggest adding a small zipper pouch on the back of the FuelBelt Tech Fuel Hand-Held Running Water Bottle system to carry keys or a small snack rather than the phone holder. Overall, I would highly recommend the FuelBelt Tech Fuel Hand-Held Running Water Bottle. It is an extremely comfortable way to carry hydration for medium-length runs. I have now had the opportunity to wear the FuelBelt Ergo Hydration Running Belt for several runs. The distances that I ran to test the belt ranged from 10 – 18 miles, and all of the runs were in hot, humid conditions. This belt is, hands down, the most comfortable hydration belt I have ever used. The reasons that I like it so much are that it does not get hot underneath the belt, even in very hot conditions, and the bottles are held very securely in the belt. They do not bounce or jiggle as bottles tend to do in some hydration belts I have tried. My phone was held securely in the front pouch and was easy to take out and put back in. There was also room in the pouch to hold some snacks (almonds and dried apricots) for the longer runs. I did spot two potential problems on one of my runs that I did with a friend. I usually stop and walk when I take a drink from one of the bottles. Because my friend usually keeps running, I tried to run while I hydrated. When I slowed down to a walk, the bottles were easy to remove and replace from the belt. When I kept running, the bottles fit so snugly into the belt they were difficult to replace. I think the snugness of the bottle in the belt, however, is a good thing. It made the belt much more comfortable to wear. It does make them more difficult to replace into the belt, however. The second problem was the difficulty my friend had drinking from the nozzle of the bottle when I shared my water with her. I tried to coach her through the process, but she eventually had to unscrew the cap to drink. I did not have any trouble drinking through the nozzle, but I usually unscrew the cap to drink too. This might be a drawback. I enthusiastically recommend the FuelBelt Ergo Hydration Running Belt. After using it for a race and several medium-to-long runs, it is my go-to source of hydration in hot, humid weather. I recently ran a half marathon on a rail trail on a hot and humid morning in York, PA. I used the FuelBelt Ergo Hydration Running Belt for the first time. 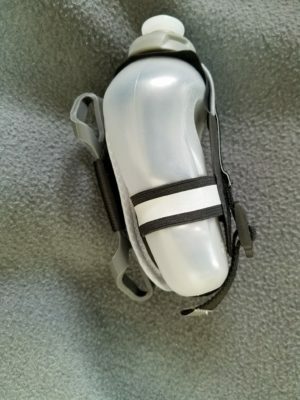 The three features I was especially interested in were the micro race locks to hold my race bib in place, the front pouch to hold my phone, and, of course, the overall fit and comfort of the belt. I attached my bib to the belt using the micro race locks provided with the belt. I was apprehensive about the bib flopping around since I usually use 4 pins to secure my bib, but the race locks worked well. There were no issues with a floppy bib. The belt was very comfortable and I liked having my own hydration for 2 reasons, even though the race had adequate aid stations. First, I could provide the hydration of my choice. I sometimes do not care for the hydration provided by races. Second, I could hydrate when I wanted to. Sometimes my need for hydration does not coincide with the location of water stops in a race. The amount of liquid in the two 8 ounce bottles was adequate for the half marathon, even on a hot day. The belt did not make me hot, even on a very humid day. The bite valves were easy to use. I had no issues getting the liquid out of the bottles easily. In a training run, I like to unscrew the cap off of the bottle and drink directly from the bottle, rather than using the valve, but during a race, I liked the time-saving option of just drinking directly from the valve. The phone carrier in the front pouch of the FuelBelt Ergo Hydration Running Belt was comfortable and easy to use. I did not pull my phone out during the race, but carrying the phone was convenient and I did use my phone to take pictures before and after the race. All three features lived up to my high expectations. To read my review, click here. I have a favorite loop that I like to run which starts at a nearby rec center. The length of the loop can be varied, so that the total distance is anywhere from 6 – 12 miles. I took the FuelBelt Tech Fuel Hand-Held Running Water Bottle out for a spin while running a 7.5 mile version of this loop. The temperature was in the low 80s and the humidity was high during this run. I was very happy to have some hydration along with me. The ergonomic design fit my hand perfectly. It was much more comfortable than my previous hand-held water bottle (an older model also by Fuel Belt). The temperature during my run was in the low 80s. The amount of fluid that the FuelBelt Tech Fuel Hand-Held Running Water Bottle could hold was adequate for this run. The unit did not make my hand hot, even though the temperature and humidity were relatively high. The strap was comfortable. It did not become loose as I ran and was easy to adjust. The valve was easy to use, but when I take a drink, I prefer to unscrew the top and drink directly from the bottle, rather than the valve. I love the new design and will use this on more medium-length runs. 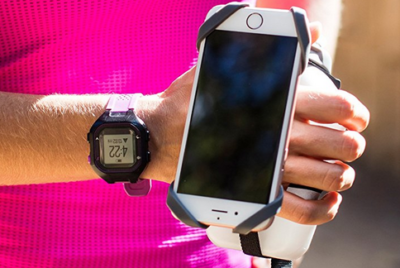 There was one feature of the FuelBelt Tech Fuel Hand-Held Running Water Bottle that I did not use for the entire run – the phone holder. In my opinion, this is not a comfortable way to carry a phone. I have a Samsung Galaxy S7 phone. Even though it was held securely in the straps of the carrier, it flopped around on my hand and made the entire system much less comfortable. To read my review of the FuelBelt Tech Fuel Hand-Held Running Water Bottle on its first test run, click here. 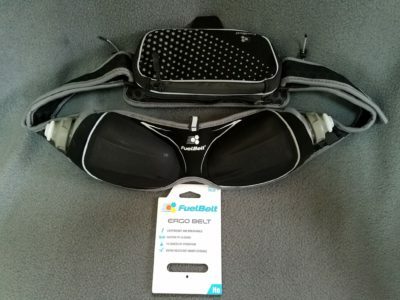 I reviewed the Ergo Hydration Running Belt by FuelBelt. The FuelBelt Ergo Hydration Running Belt is a lightweight belt designed to carry two eight ounce water bottles. It is specifically designed to fit a woman’s body. The water bottles, which come with the belt, are BPA-free. It contains is a storage pouch for smart phones, which is completely detachable. Inside the pouch, there is a hole for a wire to be inserted, in case you are using wired ear buds. The pouch is held in place by Velcro and a zipper. Two detachable micro race locks are also included. These are used to hold a race bib in place without pins, saving expensive tech shirts from holes and snags. The belt contains reflective accents for visibility when running in low-light conditions. Hex foam moisture wicking padding surrounds the inside of the entire belt. The FuelBelt Tech Fuel Hand-Held Running Water Bottle is a lightweight method to carry up to 10 oz. of hydration on a run. There is an adjustable strap, so you can adjust it to fit around your hand comfortably. The FuelBelt Tech Fuel Hand-Held Running Water Bottle is dishwasher safe (top shelf only), which is a real plus. The bottle is BPA-free, so you don’t have to worry about Bisphenol A leaching into your water from the plastic. The FuelBelt Tech Fuel Hand-Held Running Water Bottle has two gel pack loops to securely hold gel packs. It also has a smart phone holder, so you can have easy access to your fitness apps and music. The loops that hold the smart phone in place stretch, so any size phone can be accommodated securely.